Download IBPS Clerk CWE IV 2014 Merit List - Download IBPS Clerk CWE IV 2014 Interview Result - Download IBPS Clerk CWE IV 2014 Appointment Letters - Check IBPS Clerk CWE IV 2014 Joining Date – ibps.in. Latest News on 01st July 2015: Canara Bank has released provisional list of candidates who have been identified the post of Probationary Clerk on official website. The list has released state wise in which roll number, registration no. allotted category. The selection of probationary clerk will be made on the basis of IBPS CWE IV online written examination followed by Interview. 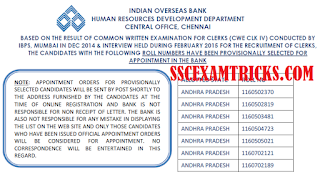 Latest News on 11th June 2015: IOB Clerk 2015 selection List Declared- Check IBPS Clerk CWE IV State wise Selection List for IOB here: Indian Overseas Bank (IOB) Selection List (State wise) has released on 11th June 2015 on official website based on the performance in IBPS Clerk CWE III held in December 2014 and interview was conducted in February 2015. The appointment letter of these provisionally selected candidates will be sent by post to their permanent address mentioned at the time of registration / apply online application form. It is declared by IOB that Bank will not be responsible for NON-RECEIPT of appointment letter of the candidates. Only those candidates who have been issued official appointment orders will be considered for appointment. 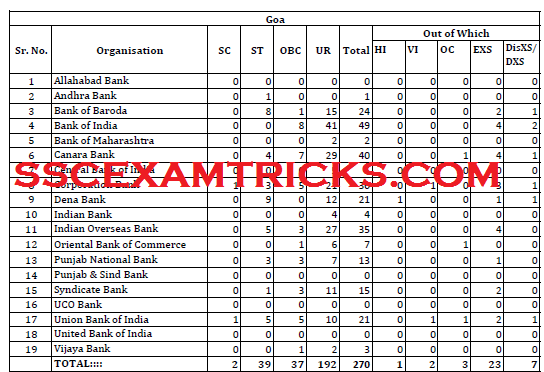 Those candidates who are waiting for Bank selection list / Bank Allotment List, they can download state wise list which is given roll number and name wise from direct link given below. 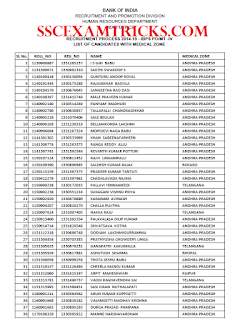 Bank of India has released list of provisionally selected candidates with their medical zone on 04th June 2015 on official website www.bankofindia.co.in for the post of Probationary officer (PO). 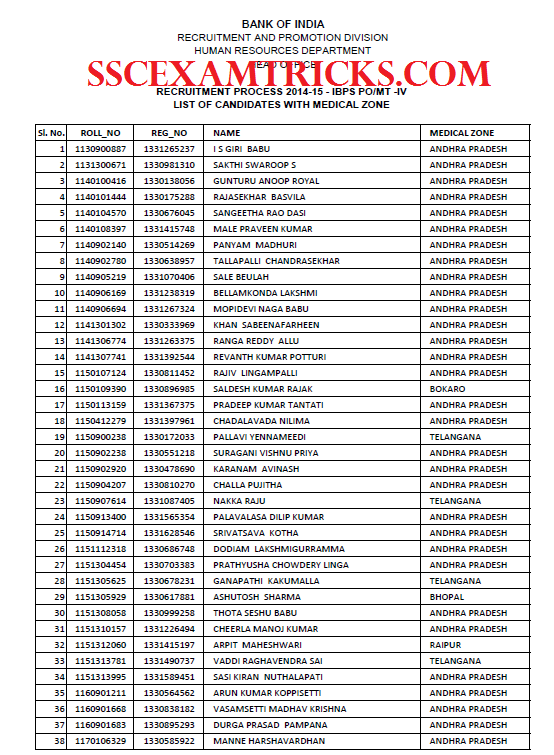 These candidates have to report for pre-recruitment formalities at these given medical zone. BOB has also released list of documents on official website which will be produced during these formalities. BOB has released list of 1978 candidates who has selected for Joining formalities i.e. document verification or other formalities based on the performance / cut off marks obtained in IBPS PO IV which was held in 2014. BOB had also released a list of 107 candidates whose candidates are kept in pending and they are required to submit their document for their eligibility for this post. Those candidates who had qualified IBPS PO IV 2014 and waiting for allotment / joining, they can download List of selected candidates with BOB Joining Formalities for Probationary Officer from the direct link provided below. 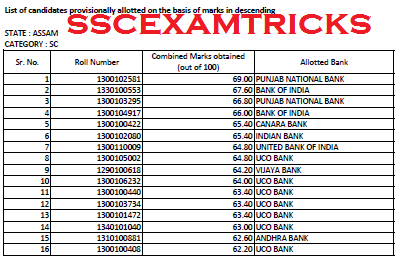 The latest News is that IBPS has released the final allotment list for the post of Clerk on 16th April 2015 on official website The final allotment of station will be provided to the candidates based on their Merit List which will be prepared descending wise from the final marks obtained by the candidates. The candidates will fall in the choice of the candidates through the merit list which was filled during apply for these posts. The candidates are required to produce / submit the photocopies of the documents at the time of getting appointment letter. 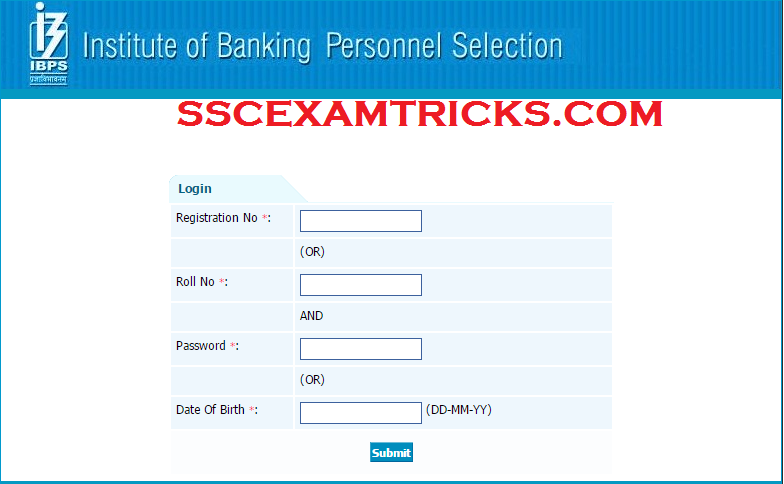 Earlier Institute of Banking Personal Selection (IBPS) is going to release Final Result / Interview Result which has released on 01st April 2015 for the posts of Clerk based on the performance in written examination and personal interview conducted by IBPS. The Final Appointment/ Joining Date/ Seat Allotment of finally selected candidates will be done in the month of April 2015. IBPS has also released state wise allotment list of finally selected candidates on official website. Earlier IBPS had released notification advertised for the posts of clerk in which online application was invited from 12th August 2014 to 01st September 2014 on the official website. Approx. 40 lakhs numbers of candidates had applied for these posts. The IBPS Clerk CWE IV which was held on 6th, 7th, 13th, 14th, 20th, 21st, 27th December 2014 at various centres in all over the country. Lakhs of Candidates had appeared in written examination and qualified for interview session which was conducted on 9th February 2015 to 19th February 2015. 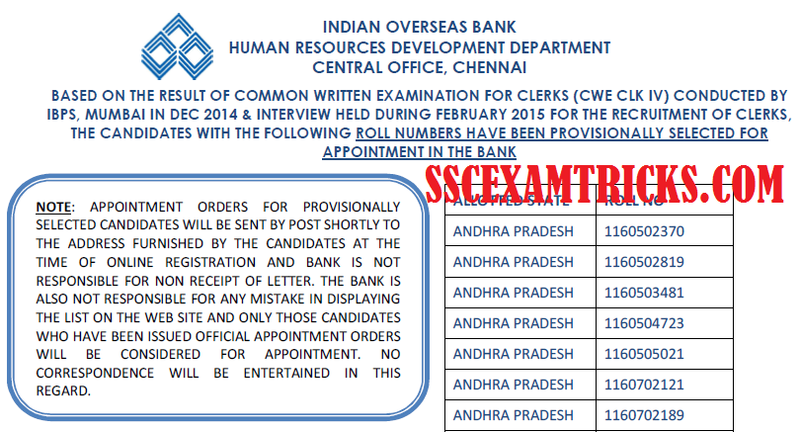 IBPS had released scorecard for the qualified candidates of Qualified Candidates called for Interview for Common Recruitment Process for CWE Clerks-IV on 09th March 2015 on the official website. Those candidates who had appeared in interview and waiting for the Final Result; they can download their Final result from the direct link provided in the end of the posts. · The Final Result will be displayed on the screen. · Click on the link say save as pdf or print the Final Result. · Save and print Final Result Hard Copy for the Interview requirements. A Final Merit List of Finally Selected Candidates based up on the performance in interview and written exam marks will be released on the official website of IBPS. The Final Allotment will be provided in the month of April 2015. The Finally Selected Candidates for these posts should bring and deposit the list of document which is provided below at the time of receiving appointment letter from the authority. Attention: Candidates can get latest news of latest jobs, admit cards, results, scorecard, counseling schedule and document verification of the candidates as they frequently visit website for getting regular updates. Reader can get latest news of Haryana JBT Teachers Final Selection List, Chandigarh JBT NTT Document Verification, Chandigarh TGT recruitment latest news etc. on sscexamtricks.com. Besides this, readers can download tips-tricks & General Awareness questions answers sets for recruitment exam / entrance exam 2015-16 prepared from most popular books to the candidates to achieve cut off marks in any exam 2015-16.